I was so focused on my missing Vanar Legendaries that I hadn’t noticed there was a perfectly fun and usable deck available in my collection for much cheaper. Thanks a lot to @snowshot for helping me refine the deck below. VESPYRS! Sorry I’m getting excited, this deck provides so much fun and cartoon violence. Open with a string of Gravity Wells and put a Snow Chaser on the enemy side. Or maybe an early Borean Bear can be buffed nicely with a string of Bonechill Barriers. Also try to get a Glacial Elemental in a safe place (this guy can be played at any point in the game, with an avalanche of Vespyr spawns it has hysterical damage output). Dump as many Vespyr minions as possible, and make your board awfully sticky thanks to Animus Plate. A single proc or two is already amazing value. Vespyrian Might is a backup/surprise at this game stage also, and enabled by Iceblade Dryad (which is just a Mist Dragon Seal with a cool body, use it to bring a backline buffed Elemental). Sustain your hand with Snow Chaser and Endless Hunt. Use Reliquarian to sacrifice any minion with 3+ attack for an overwhelming pack of new Vespyr wolves, in case you hadn’t enough already. If you have a Glacial Elemental around when you do that, this will hand you the battlefield on a silver platter. Swing once with Draugar Lord, then hammer his skull into an artifact! He won’t mind and will keep fighting for you in the form of a 4/8 Ice Drake. Aspect of Ego is basically the slot for a tech card / fun card. Put something you like in its place. An idea would be Aspect of the Bear instead, that would do well with your walls and also serve as a valid target for Reliquarian. Or Frigid Corona if you want to thin the deck a bit and add some real draw. In case you were wondering: The Howling Relic spawns from Reliquarian do NOT get instantly buffed by Animus Plate during the same attack, sadly. Disclaimer: This is Silver, I don’t play well and very often. Still, this deck stomps, here are my two last matches. https://play.duelyst.com/replay?replayId=-LPlGkPDsiye4YEijFi7 : Pile driving Vaath into the ground. Edit: The Unhallowed boss was also a piece of cake. CHEAP??? 9800 spirit is CHEAP? For Vanar mains, yes. Vanar starter pack: Embla, Seraphim, Cloudcaller, Gravity Well, Ice Age, Wake, AotM, and Reflection. Unfortunately yes. This is why I was so happy to find a deck that didn’t completely rely on these. Seraphim and Cloudcaller are staples in Ramp/Midrange, Embla, Ice Age, and Wake are staples in Wall decks, and Gravity Well is a staple everywhere. Reflection and AotM are not exactly staples but still are solid spendings. I wish it was. I’m attempting but struggling to stabilize it but, at least with the cards i have, it all feels so difficult to keep up with the rythm of other decks, or push back the enemy to force it out (cannot afford/don’t have Denadoros and he’s competing in space with a much necessary, imo, Maia). The biggest point in Vanar is that it might be one of the most varied classes in terms of possible archetypes, so everything there is a stapple of a possible/effective archetype. oh boy we have such different definitions of staples. i mean golem trio for vet is a staple to me because they fit in literally any vet deck, not specific deck archetypes. e.g. i would call chrome cold a staple. I would have calledgravity well a staple at least, but it’s also fallen out of favor since skorn and a lot of the now-popular aoe ping cards make very short work of them. i do see that most vanar archetypes are expensive though. but seriously: mecha vanar, infiltrate, burn. none of those warrant 9k spirit and two of those are viable enough with good piloting. Elaborate on mecha and infiltrate lists, if possible. Never seen them working properly without them looking like essentially a plain pure neutral shell with a fancy (or just Faie’s) ice bbs. But Vanar is so weak that they have to run Gravity Well. Besides, it’s still a really strong card in a vacuum. You can play without one or two of those in some archetypes, but unfortunately @halcyon98 is right. I don’t have specific lists, but i see them enough in gold to diamond. buffs, mechs, and probably silver. hearth sister is nice for tele-sword. wasn’t kara mech always solid? might even be better now that single ranged removal isn’t as popular AND mechazor is buffable now. i haven’t updated it in forever (aside from adding araras and endless hunt), but this deck earned me at least two ranks higher in diamond back then. vanar is quite expensive and every thing is a staple. but not much as a staple like the fact that your key cards usually are narrow (meaning - part work as a setting and part as a trigger, so you can’t run only one, you need both). or holding the archetype together/ having very strong effect on board + body that might help you cover ground without stretching your gameplan away from target. For a cheaper Vespyr deck check below, it’s @snowshot’s creation I only changed a couple of cards (since Mana Death Grip has been nerfed). 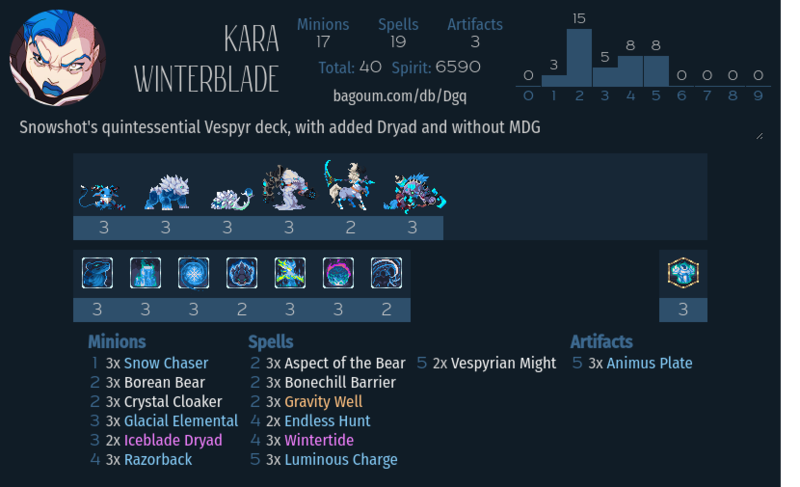 Hearth Sister can replace Iceblade Dryad if needed. The rest is probably at its cheapest and seems rock-solid.